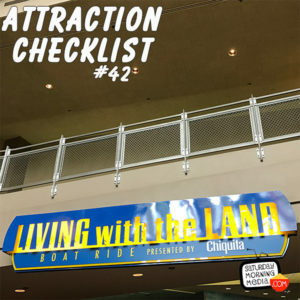 http://www.attractionchecklist.com – EPCOT is our destination this episode as we head to The Land pavilion to ride Living With The Land. John B. deHaas is joining us once again and he tells us of the time he almost worked on this attraction. The audio quality on this one is especially good. A must listen. Recorded on August 14, 2017. This episode, by request, we head back to EPCOT in Walt Disney World to ride The Land pavilion’s signature attraction, Living With The Land. As of this recording, this attraction has a sponsor as it it presented by Chiquita. The guide map describes this attraction in the following manner, “Sail through the greenhouses of The Land to see nine-pound lemons and more.” Seriously, that’s how this attraction is described in the guide map. The Thrill Level describes this attraction as being a Slow Ride. Before we go check out those nine-pound lemons, here are five fast facts about Living with the Land. 1. Living with the Land is an EPCOT opening day attraction having opened with the park on October 2, 1982. When it opened the attraction opened, it was called Listen to the Land but the name was changed in 1993. 2. There are 35 animatronics in this attraction including monkeys, buffalo, goats a dog and a rooster to name a few. Perhaps to drive home the thought of living with the natural environment, there are no human animatronics on the attraction. 3. The audio animatronics seen during the American Prairie sequence of the ride, we actually built before EPCOT even opened. They were originally meant to be part of a Magic Kingdom attraction called the Western River Expedition, but that ride was scrapped in favor of building Pirates of the Caribbean instead. 4. As you pass by the farmhouse, you’ll see the number ’82’ painted on the mailbox. This is a small tribute to the year EPCOT opened, 1982. 5. When the attraction originally opened, each boat was captained by a cast member who took you on the tour, these were later replaced by a pre=recorded narration. Also, the attraction used to feature the classic song, “Listen To The Land” written by Bob Moline. Though the song is no longer featured on the ride, an instrumental version of it plays in the land pavilion several times a day. And now, let’s ride Living with the Land. Joining me today is John B. deHaas and after the ride audio we’ll give you our shouts on this classic attraction. This is a binaural recording so if you have headphones, put them on now as we are about to experience Living with the Land at Walt Disney World’s EPCOT!